Sussex Sedition: Oh, Doctor Beeching! 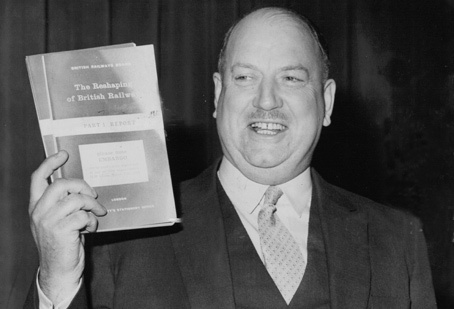 Fifty years ago next week, Dr Beeching’s report, ‘The Reshaping of Britain’s Railways’ was published. The report’s recommendations, accepted by Macmillan’s Tory government, resulted in a third of Britain’s rail network, and more than half of its stations, disappearing by the end of the 1960s. The Beeching Axe, as it was popularly called, was the most decisive blow in the economic death of rural Britain. Despite living in Forest Row, Beeching did not spare East Sussex. The Cuckoo Line, linking Eridge in the north of the county with Polegate in the south, fell victim to his axe. Those two stations survived, as they were connected to other lines, but the cuts sounded the death knell for the stations in between: Rotherfield and Mark Cross, Mayfield, Heathfield, Horam, Hellingly and Hailsham. Named after Heathfield’s spring Cuckoo Fair, the defunct line south of that town eventually became the Cuckoo Trail in the 1990s after it was purchased by the county council and developed by the sustainable transport charity, Sustrans, as part of the National Cycle Network. Today, the trail provides 14 miles of footpath and cycleway, and has been extended down to Hampden Park in Eastbourne. Although the tracks are long gone, there are still some signs that there was once a railway: some buildings, embankments and bridges remain and names –Station Road – betray the erasure. But for twenty years after the trains stopped running, there were even more solid reminders of the Cuckoo Line. Platforms, yards and siding sheds were all very obvious in the late seventies and early eighties when Chris Jennings was taking photographs of the remnants of the railway age. If you visit his website there is a particular selection of ghostly black and white images, shot on a sun-bathed day in Hailsham in August 1978, that show the abandoned railway about to be superseded by the overgrowth of nature.